The pressure does not seem to have abated yet but at least we did get time to have a weekend away over the Bank Holiday. This was in part though to deliver a couple of the last framed fells from The Wainwrights in Colour to a happy customer. The previous week had seen me dispatching the last of the backlog of orders for the book so now the decks are clear for not only the steady stream of daily orders which are coming in but also for another consignment of the 5000 books which are due for delivery tomorrow. Thankfully the whole order has been delivered in stages which has allowed me to have some space in the unit to operate. So far about 800 copies of the book have been dispatched using the courier company Yodel with a couple of hundred other copies being handed over to customers in person. No system is perfect but I have to say that in all the orders dispatched by courier, only very few (about 6) have either gone astray or been damaged. Not bad considering that some of the shipments have gone as far as New Zealand and California. Now the task is to keep on top of the incoming orders and supplying the local bookshops that have been asking me to stock them with copies of the book. In the main these independent shops are located in and around the Lake District region and so far I have been able to get to only a handful of stores but the response has been rather good. 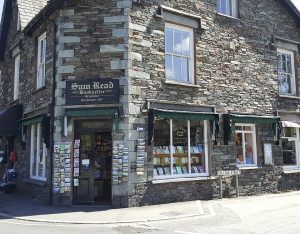 These stockists such as Sam Read’s bookshop in Grasmere and George Fishers in Keswick are able to retail the books at the cover price of £39.00 and therefore saving anyone the post and packaging charge. 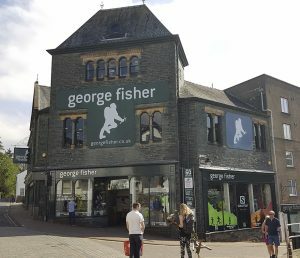 To find out where these stockists are then check out the map on this page. The list of stockists should increase over the coming weeks but if you have a local bookstore who you think would like to stock The Wainwrights in Colour book then just ask them to contact me. Have you read the book yet? If so let me know what you think. I am grateful to all of those who have contacted me either via email or through social media about their thoughts on the book but now I have added a “Review” system to this page. It is always nice to hear what people think of the book but also informs those who are considering buying a copy about what they can expect. Online retailers ask for reviews all the time and for good reason, the more reviews, whether good or bad help to promote their products. It is exactly the same for someone like me, the more the page fills with the testimonials the more it is seen. So, if you would be so good as to give up a moment or two of your time to submit a review (even if you have emailed me already) it would be greatly appreciated. Review the book here.